I receive a lot of e-mail from appraisers commenting about the time they spend working on requests for clarification on appraisals they have submitted to their clients. That prompted me to post two polls related to these client requests. The first poll asked, “What percent of your assignments result in a request for clarification from the client?” The results were a little different than expected with nearly half (45%) of the 4,691 respondents stating that they only get a clarification request 0%-10% of the time. That is actually lower than expected based on what I hear from appraisers directly. The second most popular answer was 11%-20% of the time with about 19% of the vote. The number of votes continued to get smaller as the percentages increased (13% chose 21%-30% while another 8% answered 31%-40%). After that, things take a bump up. Nearly 15% of the appraisers responded that they get a request for clarification on more than 40% of their appraisals. I can see where that level of requests could make it difficult to get the new work completed on time. 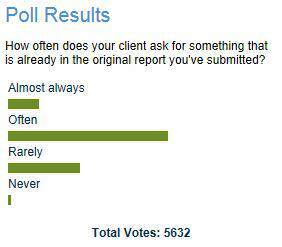 The second poll related directly to the previous one and asked how often your client requests information that is already in the original submitted report. In other words, we are asking how many of the above requests for clarification were un-necessary because the client already had the needed information. This was a popular poll with 5,632 responses and the overwhelming answer was “often” with 60% of the vote. About 27% responded that they “rarely” run into this situation while only 1% said it “never” happens to them. Another 12% answered that this “almost always” happens. So it looks as if we have a fairly large number of appraisers being asked for additional information that is already contained in the report. Anyone who believes poll taken by a colony of appraiser leeches deserves a job in the appraisal business. There are better careers out there appraisers. Far better ones.